When Pokémon Go first set the mobile market alight this summer, the AR-powered title only tapped into the original batch of Pokémon from 1996's Pokémon Red & Blue. After teasing more pocket monsters would indeed be coming to the game, developer Niantic Labs has finally unveiled its next wave of gotta catch 'em all creatures. 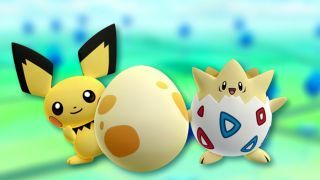 Starting today, Pokémon Go-ers can hatch select Pokémon from the second generation in the series - a.k.a. the ones found in 1999's Pokemon Gold & Silver, should you be the nostalgic type. For that extra "aww" factor, Niantic also revealed that from now through December 29, Trainers across the globe can venture out and catch a limited-edition Pikachu. What makes this Pika so special, you ask? Well, the iconic electric mouse is wearing a cute lil' Santa hat to commemorate the holidays, that's why! Seriously, look at it! It's adorable.